We recently completed a routine inspection of Squibb Bridge, and unfortunately, discovered a piece of wood in poor condition. Out of an abundance of caution, we have temporarily closed the bridge while our engineers conduct further analysis. This analysis will fully inform the appropriate repair and associated timeline. Since Squibb Bridge reopened in the Spring of 2017, it has again become a popular and vital access point to Brooklyn Bridge Park, and we are committed to ensuring that it remains one. We are working closely with our engineers to reopen the bridge as soon as possible and will provide updates. We appreciate everyone’s patience and understanding. We hope it will re-open soon. Or maybe the people living in the pricey apartments don’t like people peering at them? I tend not towards conspiracy theories, but after how many years and how many millions, after such a brief re-opening, it needs work AGAIN? A viable theory. I personally couldn’t imagine spending so much to live in a place with a pedestrian bridge crossing outside my window. What this probably means now will be more pedestrian traffic for Joralemon Street. “Fool me once shame on you. Fool me twice shame on me.” I was suspicious the first time and now we have a do-over. The bridge is another route making Brooklyn Heights a thruway to BBP. I like BBP, but I don’t like that our neighborhood seems to be becoming “101 ways to get to BBP.” I hope the bridge closes, permanently. I hope that the city finds a way to route people around our neighborhood, not through it. Also, are there any notices on Columbia Heights that the bridge is closed? There’s also the constant litter that park-goers generate as they walk through the neighborhood. The sidewalks on Joralemon have become a sea of paper cups, candy wrappers, bottles, cans, and newspapers. The park really ought to hire someone to manage the impact on our streets. Yeah thanks — just direct them down Joralemon. Make that crowded, narrow street, filled with kids knocking plants of stairs, even worse. Joralemon is more crowded than the Borough Hall subway stairs at this moment thanks to the Park and the over development of Pier 6. Not liking the sound of a bouncing basketball or ball seems petty. Would you prefer the sounds of gunshots instead? 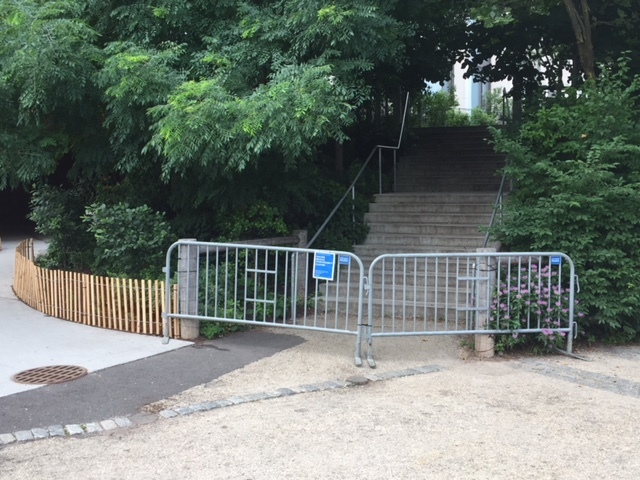 You are right though, putting up a notice that the bridge is closed can keep people out of the neighborhood and send them along Cadman Plaza would seem like obvious common sense. But don’t count on it. BBP access by way of Atlantic Ave, Old Fulton St, and Dumbo only. The person is entitled to point out this negative aspect of BBP, and it is a negative. This is, or was, a quiet residential neighborhood and should not be used as a gateway for recreation. There ARE other ways to get to the park without disturbing the peace and quiet and it is not wrong to point this out. Such a petty response, BobLaw2. I bought in Brooklyn Heights for many reasons; one of them was the quietness of the neighborhood. I am not against the park. I like the park. I simply wish I had my quiet neighborhood, back. Why should I be happy that my neighborhood has changed in a negative way, especially when there are other routes that are just as convenient for the rest of the city to enter and exit the park? Why such hostility towards that view? I love the bridge for its convenience & vistas. I live in the north Heights & hope it comes back soon. Sound of bouncing balls versus gunshots is an odious comparison. How about sound of bouncing balls versus no sound at all? Or sound of children’s laughter? Maybe contact 311 and the BHA, and suggest more trash receptacles on the street? Like most conspiracy theories, it doesn’t hold up to logic. The bridge was there before any apartments were purchased and only a couple of the lesser value ones are in direct view from the bridge. What possible argument or leverage would at best a half dozen residents have to force the closing of the bridge? Weighed against the millions invested in the bridge, it being a huge attraction for the park and it being an easy access to and from the hotel and condos. Sorry hon but your theory is utterly ridiculous. Well people bought them with the bridge there so they have no grounds for complaint, Also, do you even know what windows are facing the bridge, are they apartments or common sections of the buildings? LOL, the City couldn’t care less (nor should it) how people get to the park. “a sea of paper cups, candy wrappers, bottles, cans, and newspapers”?! I walk up and down Joralemon literally every day, from Furman to Court and back, and rarely see ANY trash on the street, let alone a “sea” of it. Good idea. The litterers may disregard them anyway but it’s worth a shot. Also, perhaps our friend BobLaw2 has different standards of cleanliness but I too bought a place in the Heights for its quiet, fairly clean atmosphere and am not willing to live in a pigpen. Not true. They’ve established ferry routes from Piers 1 and 6. My comment was in reference to the park traffic through the heights. Try reading the post I was responding to. Not laughter, so much as hilariously inappropriate pop songs with many of the lyrics misheard and repeated back as the wrong ones, also hilariously. After the first, much-protracted, defanging of the bridge it lost almost all its bounce. For us that had been a huge draw. We had gone from calling it the Bouncy Bridge to calling it the Boring Bridge until just a few weeks ago, when a just-detectable degree of movement came back to the first big upper portion. I suspect it’ll be Boring again if/when it reopens. This whole thing is like watching the finale of One Flew Over the Cuckoo’s Nest. No surprise. Walked it last week and a few weeks back… big old mess, scary bridge, structural instability… It’s unfortunate, but it may be timely. With the pending pool and other ongoing problems, this gives the admin / park / BHA folks a good excuse to close the bride again on a “temporary” basis, soon to translate into permanent. For the North Heights residents, this is a good thing… keep ’em out! an funnel ‘m through Joralemon Street! or through Dumbo! The BHA has absolutely nothing to do with the Park or the Bridge (or the bride[?]). In fact, as I’m sure you may remember, they sued PierHouse because of its height.